woow.... nice, I like it! Is it true that these guys are bringing Namjoo? Does anyone know how to get tickets? thanks for this great magazine. Where can we get full versions of the songs that are cut short? na agha in beyond persia (va Iranian.com) websiteshon motmaeen hastesh. shoma az website haye nashenas nabayad download kony. man khoodam az khode websiteshon dl kardam. ==> www.beyondpersia.org ya inkeh meettooneen be mossighi az tarigheh www.beyondpersia.org/music.htm goosh bedin. agha ma hazer nistim chizi download koneem. mitarsim. mighoyand khatarnak hast. aya meshave online khandeh shavad, ya nah? This 'November' by Laleh is realy something! I saw their concert last friday, and I, whom am not easily impressed, was impressed. These guys are doing something that no one else has had the hosele or orzeh to do, and in terms of competition they don't even have a close second! Dametoon garm! And merci. 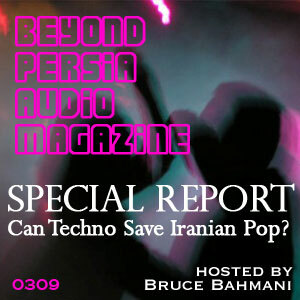 This podcast is a promotional audio magazine designed specifically to promote and inform a voluntary (willing to download and listen to it) listener about the activities of beyond Persia, a fun new non profit supporter and promoter of the Arts. The podcast is specifically designed to promote the organization and it's activities in order to increase "active" support (including you) for Iranian Art. The upcoming celebration is a review of the past year's well documented successes in doing this, and includes a full 3-show concert including Arjang Rad, Hamed Nikpay, and a special unplugged performance by Kiosk. There will however, be no apologies made for doing any of this.